A clean and simple project featuring things you'd see in the sky. This little squirrel-y guy is part of the Hang In There stamp set from Paper Smooches. I've used him several times before and he's such a fun little character! The stamp has his arms reaching above his head. Well, I decided to cut his arms and paws off - oh dear, that doesn't sound good. Anyway, then place his paws over the edge of the cloud as if he's holding on. I gave him a shiny nose with some glossy accents, then I just HAD to add some google eyes. Had to. And you know what? This card turned out just the way I pictured it. That really doesn't happen very often...lol. Thanks so much for spending a minute or two at my blog. I hope you'll leave a comment! Such a cute, quirky card. Love It! Oh how cute is that little guy peeking behind the clouds. Love it! Thanks so much for playing with us at CAS-ual Fridays! He is so cute - would make anyone smile! (hey I think I have that set) Thanks for the inspiration Susie! Awwww...love this card! That little squirrel hanging from the cloud is the CUTEST! Fab paper and amazing clouds...great job!!! I love it when cards turn out exactly how we imagined! Those clouds are fabulous and your little squirrel is simply adorable! 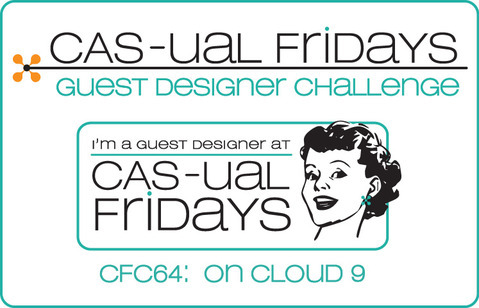 So glad you were able to play along this week at CAS-ual Fridays! I love how your card turned out! This is too stinkin' adorable! Love it! Absolute cuteness! I love how the little guy is 'hanging in there', I've found that sometimes I have an idea and just can't settle until I have the card made! A crafty day, a crafty cousin!